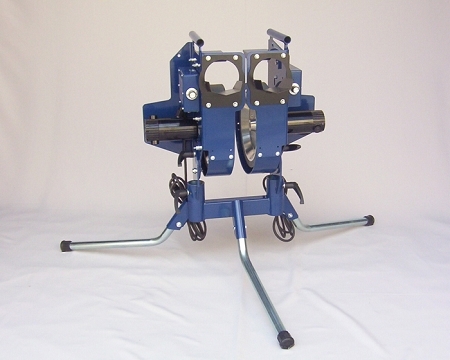 Discount BATA-1 Twin Pitch Pitching Machine - Free Shipping! Swinging at the same pitch over and over again is not only boring, but it does not represent real game situations at all. The BATA Twin Pitch Pitching Machine solves that problem by putting two BATA-1 machines on one stand. With the BATA Twin Pitch Pitching Machine, you can throw up to a 70 MPH fastball with one head and a change up with the other. You can set it to pitch low and outside with one, up and in with the other. Since you preset the pitches, there's no need to stop and reset things in between every pitch. It is powered by any standard 110 volt electrical outlet. Built to last for years, the BATA Twin Pitch features solid rubber Goodyear Soft Tread pitching machine wheels as well as a heavy-duty solid steel stand and frame. Not only do the tires last longer than air filled tires, they pitch truer, always stay in balance and have a far shorter recovery time between pitches. 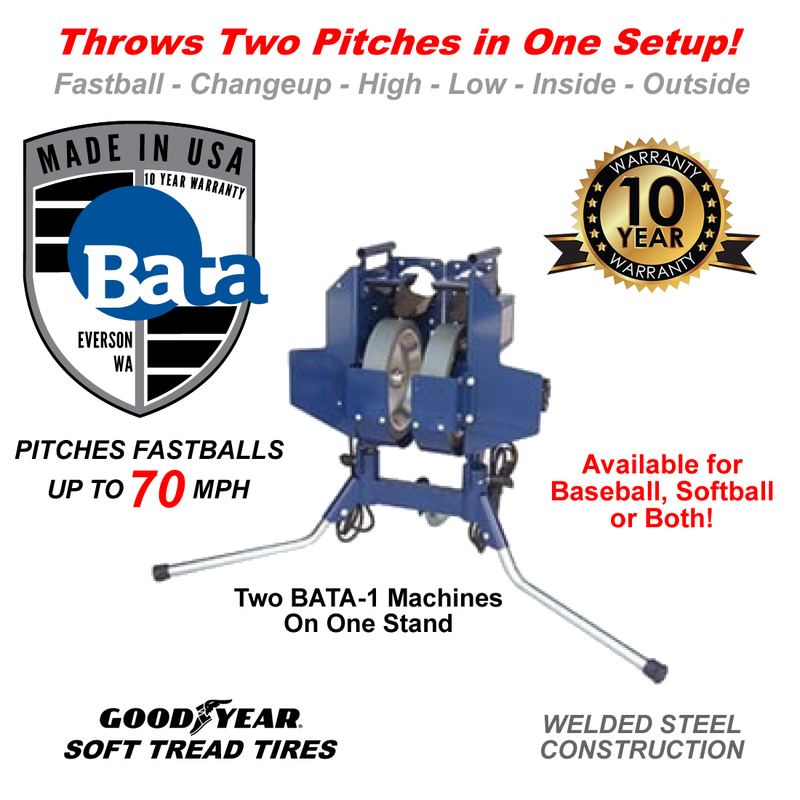 You can order the BATA Twin Pitch as a baseball pitching machine, a softball pitching machine or as a combo baseball/softball pitching machine (combo machines cost slightly more). 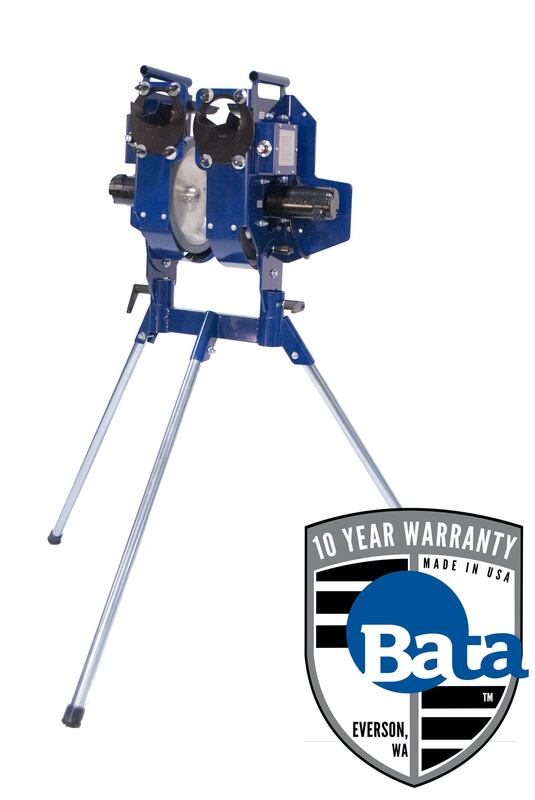 Although it will throw regulation balls, we highly recommend using BATA pitching machine baseballs or BATA pitching machine softballs - they are far more accurate, last longer and are much more "friendly" to pitching machine wheels. For easy transport, a transport wheels kit is always a great addition, too! For easy solo training, you might also want to purchase a BATA Auto Feeder and a BATA Cordless Remote. BATA Twin Pitch Pitching Machines are not "free to try" and they WILL NOT accept returns of their products unless there is something wrong with them, regardless of the reason. In other words, there is no "satisfaction guarantee" on their products. Any unauthorized returns will be refused and may incur additional charges for return shipping back to you! Every BATA Twin Pitch pitching machine is thoroughly inspected and tested before leaving the factory. It is warranted to be free of defects from workmanship and materials for the period of ten years from the date of original purchase. 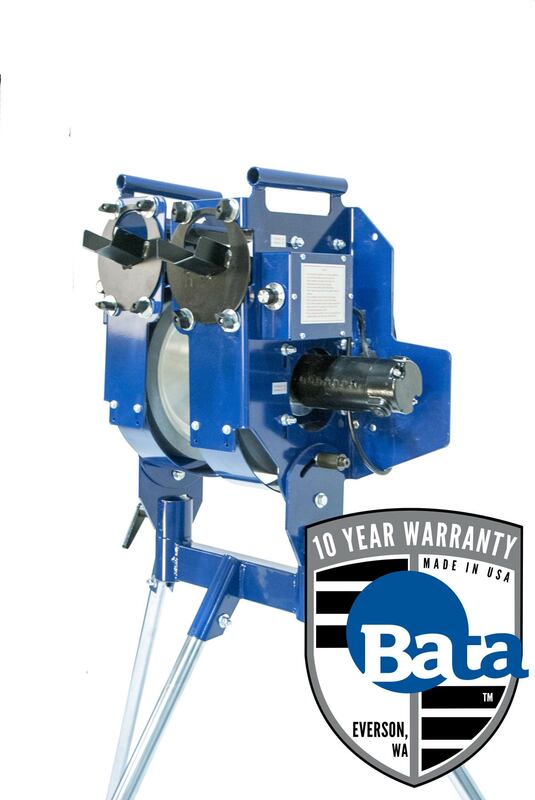 If a part or the entire BATA Twin Pitch pitching machine is deemed to be defective, it will be replaced. If the defect occurs within the first 3 years, the part or entire machine will be replaced free of charge and BATA will pay the cost to ship the machine back to you. If the defect occurs after the first 3 years, the part or entire machine will be replaced free of charge and the customer will pay the cost to ship the machine back to them. In either case, customer is responsible for the cost of shipping the part or entire machine to BATA Baseball. On all non-"wear-and-tear" parts, the part will be replaced or repaired free of charge. Tires treads are considered normal wear and tear parts and are not covered by this warranty. The BATA Twin Pitch warranty is non-transferable. If you sell your machine, the warranty becomes null and void to the third party. No matter where you order a BATA Twin Pitch Pitching Machine from, NOBODY actually stocks them; they all ship directly from the manufacturer's warehouse located in Carlsbad, California. Therefore, the shipping time frame is exactly the same no matter what website you order from (we hope that it is this one!). 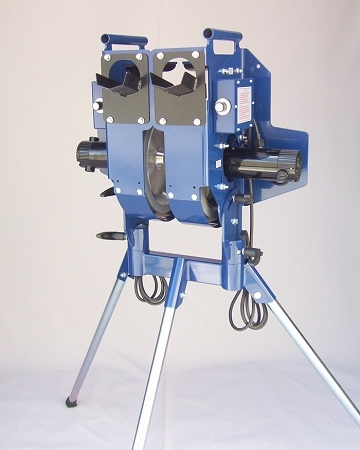 BATA Twin Pitch Pitching Machines typically take 5-7 business days to ship from the time you place your order. They ship via United Parcel Service (UPS) and could take anywhere from a day or two to a week to get to you AFTER being shipped, depending on your proximity to their warehouse. We will notify you of your tracking number the moment we receive it from the manufacturer's warehouse. 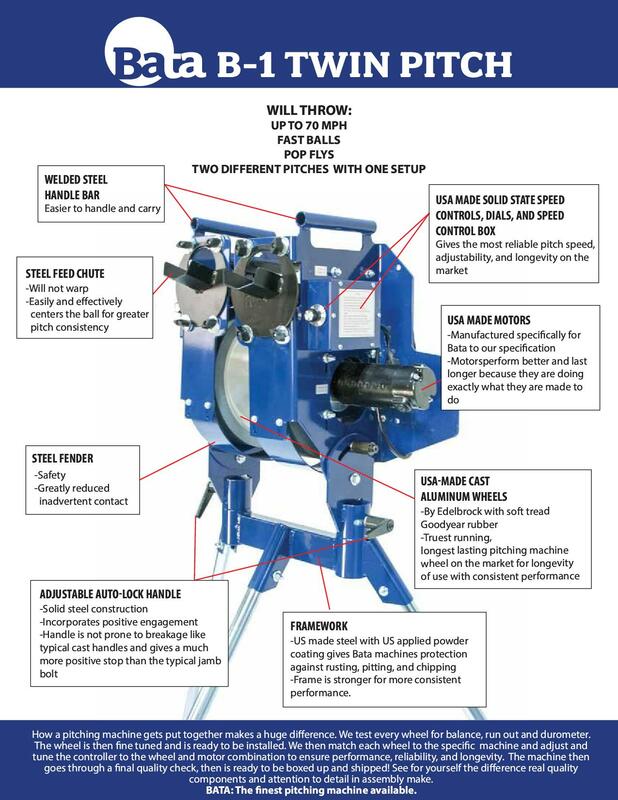 Click here to download an easy to read, printable PDF of the BATA Twin Pitch Pitching Machine Owner's Manual.